Ted is favored by sportsbooks to continue as state Senator despite criticisms by his own party over the incumbent’s lack of likeability. 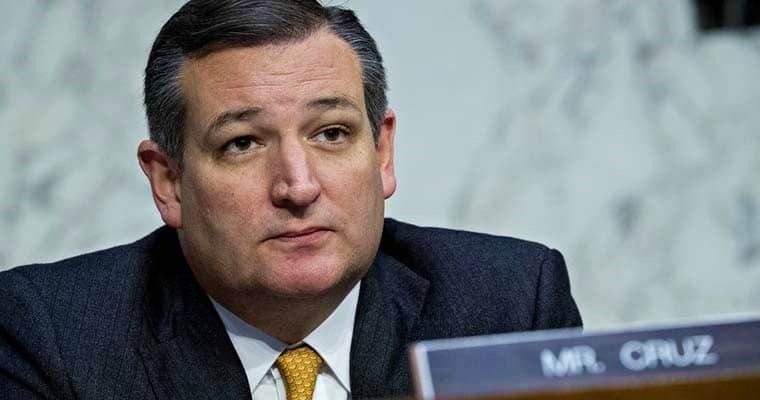 Republican Senate seat incumbent Ted Cruz faces Democratic challenger Beto O’Rourke in upcoming 2018 Senate midterm elections. Ted Cruz was added to the Senate betting lines of popular sportsbooks offering legal political betting, where his odds currently stand at -200 while his election opponent Beto stands at +160. A clear favorite for sportsbooks, Cruz is having difficultly echoing the same enthusiasm among voters and is requesting special assistance. Polls show Beto, the Democratic challenger, has a chance to steal the seat in a traditionally Republican state. Beto has taken to implement new campaign strategies which have shown to resonate with even the most rural voters by campaigning in every county within Texas. Republican members have expressed fear over Beto’s earnest efforts and worry over Cruz’s unlikability. The 47-year-old incumbent has held his seat as a Texas Senator since 2013, however, dissatisfied Republicans may begin to show their support for Beto as promises made by Cruz go unfulfilled. Conservatives have typically been the largest voter base supporting Cruz. Republicans are hoping the amount of Conservatives and Republicans in the state would outnumber any Democratic or liberal voters. Beto seems to be on a mission to convert Independents, Moderates, and Centrists using a message of unity to stand a chance against the sheer number of red supporters. Either way, Republicans are not wanting to take chances and have planned a special visit to Texas by US President Trump in October. President Trump will be there at a major rally to increase Republican support behind Cruz in his state, as well as, show his own Presidential support for the Republican Senate incumbent. This tactic could gather Trump supporters behind Cruz who may have not voted for him otherwise due to harsh criticisms of character exchanged by Cruz and the President during the 2016 Presidential election. Sportsbooks list Cruz as the favored candidate to win this Senate seat election. They may have even predicted the Republican save of using President Trump as a campaign tool. The 2018 Senate midterm election is not yet finished and depending on Beto and Cruz’s interactions along the campaign trail the odds could change significantly. Recent Texan polls have shown Cruz leading with Beto closely behind. However, a Democrat has not won a statewide election in Texas since the early 90’s. On the other hand, the closeness of Beto to Cruz has Republicans sweating and adding more pressure to Cruz’s campaign. Questions regarding Cruz’s ability to maintain his seat arose after Beto managed to gather 10.4 million dollars in small-dollar contributions with no PAC help, out-funding Cruz who has established corporate and special interest PACs within the same timeframe by nearly $6 million. This gained national media attention further fueling Beto’s name recognition and Republican doubts over Cruz. Who Won The Final Presidential Debate of the 2016 Election? Will We See Legal Online Gambling in Texas?